That the sacred thread – Yajnopavita among the Hindus and Kushti among the Parsis – is the sign of the constellation Orion’s belt, underlines its supreme significance among ancient and modern Aryans. Its mention in Vedic literature inspired the Sanskrit scholar Lokmanya Tilak to use it to fix the date of that early period of history – a task neither Yaska nor Sayana could think of. 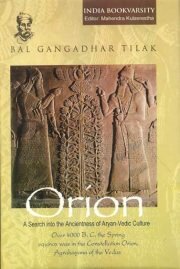 A unique and definitive study of the subject, it casts interesting new light on obscure Aryan-Vedic culture. It successfully explains the various curious and unintelligible legends and establishes Aryan superiority in exploring stars and developing the measurement of time with religious ritual such as Yajnas. Tilak’s scholarship convincingly debunks the general tendency of Western scholars of reduce the antiquity of the Vedic works and discredit Indians in many other ways. But the study has been ignored so far and needs our attention in modern times.